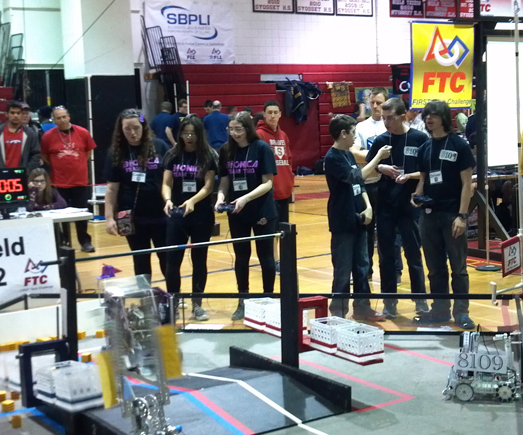 Members of Team #7120 "Bionica" (left) steer their robot while the members of Team #8109 "Beta Testers" (right) confer with each other during the FIRST Tech Challenge at Syosset High School on March 1. On March 1, New York City FIRST (For Inspiration and Recognition of Science and Technology), along with School-Business Partnerships of Long Island, Inc. (SBPLI) presented the FIRST Tech Challenge Qualifying Tournament at Syosset High School. Twenty-two teams from Long Island, the metropolitan New York area and Connecticut took part in the daylong competition. The FTC is a program through FIRST, which is an organization that focuses on teaching children and young adults STEM (science, technology, engineering, and mathematics) skills through stimulating robotics competitions. The FTC tournament requires students in grades seven through twelve to design, build, and program a robot to compete with in an alliance format against other teams. Each year, a different themed challenge is presented to those who participate in the tournament. The challenge was "FTC® BLOCK PARTY! SM", in which Alliances of two teams programmed their robots to place plastic blocks onto pendulum goals. During each two-and-a-half minute match, teams also had to raise their team flag up a flagpole, elevate their robots off the ground using a platform pull-up bar, and finish the match with a balanced pendulum to earn extra points. * Indicates that these teams will move onto the NYC/Long Island Regional Championship Event at NYU/Polytechnic Institute on March 8. *+ Pandemonium2 was the first team selected to the Winning Alliance and will compete in the NYC/Long Island Regional Championship (Please note: Team #123, "Vanguard" from Syosset, hosted the event and will also attend the NYC/Long Island Regional Championship). *++ Radical Robots was captain of the Alliance Finalist and will compete in the NYC/Long Island Regional Championship. Sponsors included School-Business Partnerships of Long Island, Inc., Syosset Central School District, Rockwell Collins, PTC, Bank of America Merrill Lynch, Bloomberg and ConEdison.